Located on Rice Lane east of the town of Amity, Keeler Estate began as an overgrown 200-acre farm bought by the Keelers in 1989. Gradually and methodically, vineyards were planted and farmed biodynamically. The vineyard is Demeter Biodynamic certified, as well as possessing LIVE, Stellar Organic and Salmon-Safe designations. The 30 planted acres include Pinot Noir clones 667, 777, 115, 943, Pommard 4 and 5, and Wädenswil. Chardonnay, Pinot Gris and Riesling are also planted. The winemaker is Darcy Pendergrass who is the winemaker at nearby Amity Vineyards. Estate Pinot Noir, Pinot Gris, Pinot Gris Reserve and Chardonnay are offered. 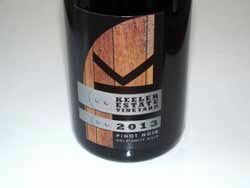 Production is less than 1,000 cases under the Keeler label. Most of the grapes are sold to Montinore. Contact the winery's website to purchase wine. The winery's tasting room is open Thursday-Sunday, 11:00 a.m to 5:00 p.m..